When you hear various terms like the ‘present perfect’, ‘past simple’, and the ‘past participle’, it’s easy to get confused and feel unsure about what they all mean. So let’s see together what the past participle is and what it is used for. The past participle of a verb is one of two past forms. As an English student, you’ve probably studied some irregular verbs, seen in a list consisting of three words: the infinitive, the simple past, and the past participle. As you can see, the third form of the verb, usually written on the right, is the past participle. When do we use the past participle? the Present Perfect – You’ve met Bill before. the Past Perfect – We had already seen the film. the Future Perfect – She’ll have finished by 12:00.
the Third Conditional – If the train had arrived on time, I wouldn’t have been late. Modals in the past – She could have studied more. the Passive form – The mobile phone was invented by Motorola. There are several adjectives in English that are created from the past participle form of the verb. In this case, the past participle becomes a word that describes a noun (a person or an object). broken – This computer is broken. It doesn’t work. interested – She was really interested in the presentation. bored – I was bored, waiting for the bus. excited – The children are excited about the party. 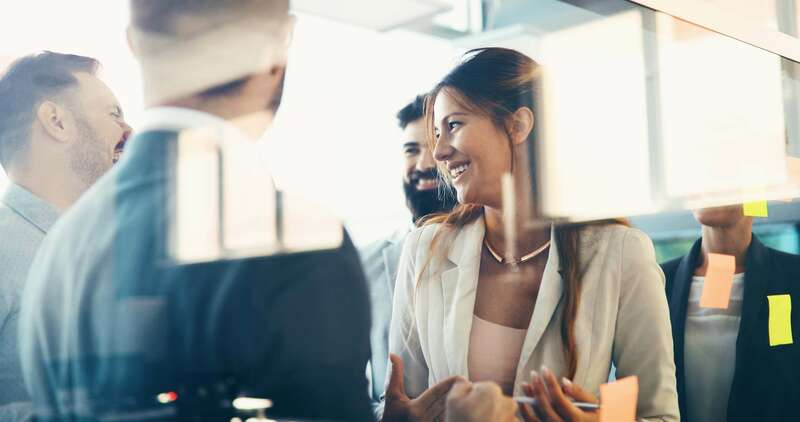 motivated – Young graduates are motivated to work hard. surprised – We were very surprised to hear the news. tired – He was tired after the match. So creating past participle from regular verbs is quite easy. Unfortunately there are also irregular verbs in English which don’t follow a fixed pattern. In this case you simply need to learn them. The best way to do this is to learn them gradually as part of a structured course. This is how students at Wall Street English learn regular and irregular verbs, and it’s more practical and fun than trying to memorize a long list. 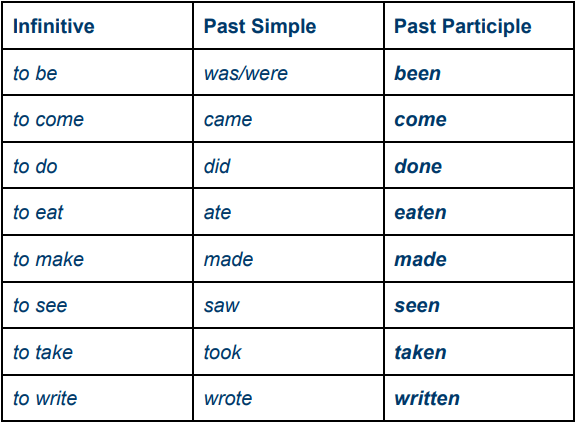 Here are some common irregular verbs, with the past participles highlighted on the right. We’ve been here for an hour. You should have come earlier. We’re late now. When I got home my family had already eaten. This bag was made in Switzerland. The managers will have seen all the candidates by the end of the day. She’s taken a day off to do some jobs at home. Has he written the report? Driven by ambition, Derek worked up to 14 hours a day. Exhausted from the marathon, the runner collapsed onto the ground. Illuminated by multi-colored lights, the skyscraper looked incredible. The Past Participle is clearly an important form of English verbs and is really useful to learn. Make a start now by doing the fun quiz on this page for practice.